Powerful desktop in a small form factor. 500GB hard drive holds your apps, videos, documents, images and other files. Features optical drive to read and write Cds and DVDs. 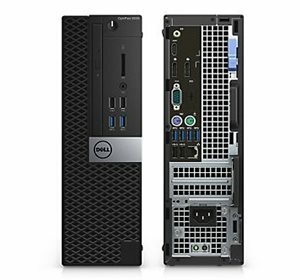 Dell OptiPlex 5040 PC: More space & performance. Small, space-saving desktop that delivers all-around performance. With dual orientation and support for multiple displays. Mighty powerful: Powered by enhanced processor. Plenty of memory: Vast memory coupled with swift hard drive. One of the most manageable: IT can manipulate BIOS settings and configure systems with ample flexibility that organizational IT infrastructures require. One of the most secure desktops is armed with Dell Data Protection hardware and software.